This timely text describes the role of program evaluation in counselor education and provides step-by-step guidance for faculty seeking to develop comprehensive Student Learning Outcome (SLO) evaluation plans to meet accountability expectations. It serves as a blueprint for demystifying the SLO process and making the switch from an input-based measure of productivity that focuses on what counseling programs do, to an outcome-based approach that concentrates on the quality of learning through evidence-based assessment of students’ knowledge and skills. The first and second parts of the book lay the foundation for the SLO process and provide practical guidance for identifying and developing direct and indirect measures of student learning. Part III offers strategies for creating measures; collecting, managing, and reporting student data; and using data to ensure competence. In Part IV, counselor educators across the country offer hands-on application through a wide variety of SLO activities and rubrics linked to each of the curricular and specialty areas of the 2016 CACREP Standards. 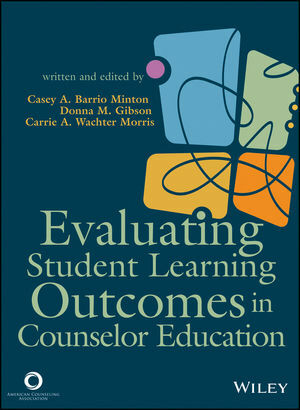 Casey A. Barrio Minton is the author of Evaluating Student Learning Outcomes in Counselor Education, published by Wiley. Donna M. Gibson is the author of Evaluating Student Learning Outcomes in Counselor Education, published by Wiley.